Xenornis: Grasshopper Sparrow (!!!) near Penonomé, a report by Jan Axel Cubilla. 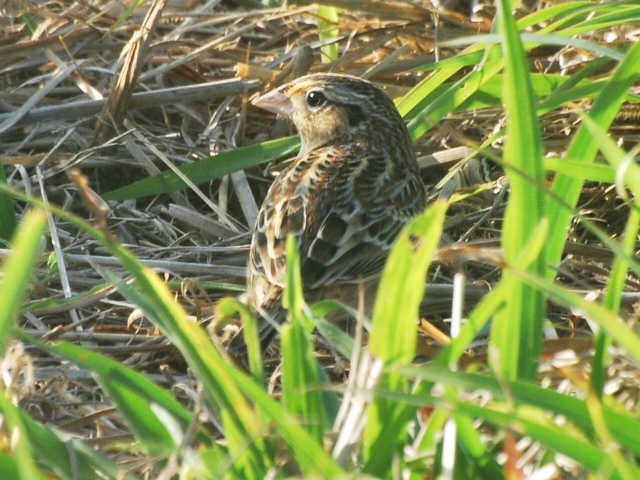 Grasshopper Sparrow (!!!) near Penonomé, a report by Jan Axel Cubilla. I just came from a short walk in the Cocle savana following the directions gave by Ken last year to find the Ring-necked Ducks close to Cocle town, 5 min west of Penonome (second dirt road to the left after the "push buttons"). After seeing the ducks (lifer), I was about to leave the place, more or less 300 mts from the Panamerican highway (I was able to see the cars in the highway), when I detected a movement right next to the car. It looked like a mouse, walking very low, even crawling under the grass, but eventually frooze no more than 4 mts from my car. It stayed for 5 minutes, only moving very quickly few steps to stand again. It didn't vocalize, not even a chip. I took plenty of photos... but I was not able to see its breast... I wonder if someone knows how to separate the migrant Grasshopper Sparrows in the field... I hope it is of the endemic race, thought to be erradicated due to habitat loss. That is AWESOME! Anyone got an address for Bob Ridgely? Seems a perfect question for him. Dan and I followed your directions today, sunday, and were successful, if not completely. I flushed the little beastie three times, and once had a pretty good look, although fast. Yellow on wing joint, etc. Sweet!